A week away taking the next generation to Kent where my grandparents lived and I spent many a summer as a boy. We spent one day in the small village of Appledore to where my grandparents retired . There will be more on that later. My father asked me to check out the grave of his parents. The only trouble was that he could not remember where it was. He insisted it was 20 yards behiond the church on the right. My step mother insisted it was on the left. Normally on matters such as who committed the war crime at the Black Hole of Calcutta or when was the battle of Agincourt I go with my Dad. On more practical matters like where did you leave your shoes or where are Dad's parents buried I go with my step mother. But the deluded lefty was wrong. As was the other deluded lefty, my father. We refused to give up and at the last minute my father called to say "extension". Sure enough in a little patch away from the Church we found a whole new raft of graves among them that of my grandmother ( named after an Island in Greece when the world was not obsessed by lesbians) and grandfather. 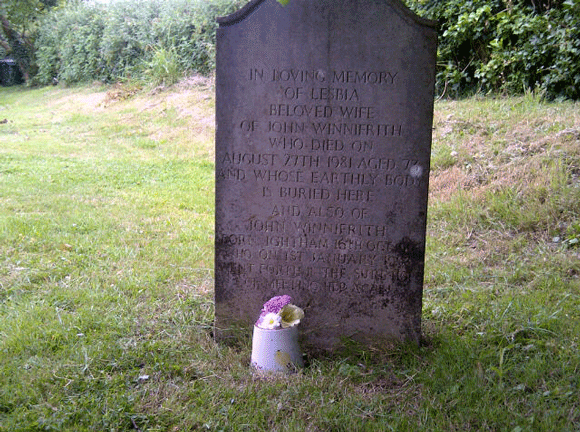 It is a simple gravestone as both would have wanted. The next generation laid a few flowers picked from the verge and we moved on.